For more than a decade, Tutoring Club of Allen has helped thousands of students in the Allen community pursue their educational goals and achieve academic success. Our location offers individualized instruction with tutors for almost every subject including - Reading, Writing, Math (including Algebra, Geometry, Calculus), ACT Prep, SAT Prep, Spanish, Sciences, Social Studies, Language Arts, Study Skills, Advanced Placement (AP). We are conveniently located across the street from the Lowery Freshman Center in Allen, TX. Our friendly tutors and positive atmosphere are the perfect choice for helping students thrive academically and gain self-confidence. Parents and students have quickly grown to appreciate Tutoring Club of Allen’s warm, fun and nurturing environment, and they often commend us on our flexibility, customer-focus and results. When we hear that a child has moved up from C's to A's, or that reading has become a joy instead of a chore, or that a student is no longer receiving F's, or a high school junior raised his SAT score 300 points after taking our individualized course, we know that Tutoring Club is bringing value to the community. 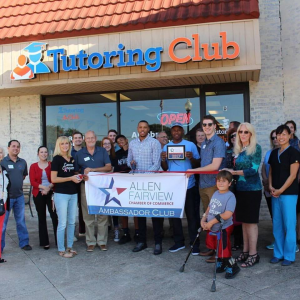 All of us at Tutoring Club of Allen are proud of the students we’ve helped since opening our doors in 2006 and are proud to be a part of this community. WHO COMES TO TUTORING CLUB OF Allen? Students from schools all around the Allen/McKinney/Plano area have found success, and fun, at Tutoring Club. In Allen, it can sometimes be difficult to find a good tutor that can help a student with their homework and prepare for tests in a constructive manner. At the Tutoring Club of Allen we pride ourselves on choosing and thoroughly vetting only the best tutors. These tutors are experienced and knowledgeable in their skill areas and can provide vital assistance to your student whether they are struggling with particular homework problems, needing a refresher before a test, or just wants to get more practice in before a final. If you have a student that is getting ready for college, we are no strangers to preparing soon-to-be freshmen with the knowledge that they need to succeed in the busy and challenging life of college with our College Prep Program. Allen Tutoring Club has skilled tutors, many of which have degrees or other experience in their areas. Our son has been at tutoring club for 1 month now and we can see his skills and confidence increasing every day! The teachers are amazing and are able to explain concepts in ways he can understand. The director is great also, she spent a lot of time with us even prior to enrolling. We are very happy with our decision to choose Tutoring Club over other options in the Allen area. My son Jacob F. used to have a C or D in writing. He has been in tutoring for almost 1 year and is getting As and Bs. Very pleased with the staff and how they make it fun for him to learn. Tristan is our Club Director/ Owner. He has 10 years of experience with Tutoring Club. As a graduate of UNT he has background and knowledge in the greater DFW area. Tristan engineered the award winning clubs of Pearland and Katy in the Houston area which were voted two of the top 10 centers worldwide. He has brought his model to DFW to continue the life-changing success the Tutoring Club of Allen has brought for its families and students. Combining his STEM acumen with a lifelong passion for helping others, Nick found his passion with Tutoring Club. He has years of experience with tutoring from elementary to college level. As an engineering graduate of Texas A&M, he developed an understanding of the competitiveness required to be successful regardless of specific skills. A native of Allen, he has brought his model back to his hometown to help the next generation of leaders reach the next level. Join for the school year, receive FREE after-school pickup.